A few weeks ago the hub seemed to be frozen (with ice) and when the nuts were a bit loose the whole hub rotated and the wires were cut. I tightened the nuts, reconnected the wires and all seemed to be OK. This week I rode to grocers, shopped and when I tried to ride back the front wheel seemed stuck again. Well, guess what? The nuts were loose again! I disconnected the wire and tightened the nuts with fingers but for some reason the wheel didn't want to spin. So I loosened the nuts and walked the bike home to prevent further damage. Took the bike to the shed and examined the hub more closely and noticed the hub has cracked! On the side where the electric wires come out there's a big nut which seems to be part of the aluminum side wall. The side wall has been bent in as if the nut were pushed in on one side. How that is possible, I have no idea. There is no damage to the electric connectors which are on the same side so I don't think the earlier incident caused the damage. To add insult to injury, my camera refused to work. Blinked the "on" light for half a second, but didn't start. So I had to shoot close ups with my md80 clone. The red dots are where the cracks are. The big nut seems to have bent in a few millimeters where the arrows are, exposing the black sleeve under it. 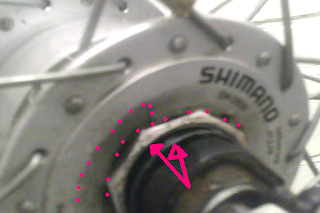 Ball bearings are also visible trough the crack. the sidewall has cracked under the nut and about one centimeter from it, half way to the outer edge of the side wall. There are also some vertical cracks connecting them. Now, is that side wall important, load bearing part of the hub or is it just a dust cover? Does it come off if I try to screw the big nut? Gotta google for some blow out pictures. The other day I took my bike of the rack and noticed the front wheel seemed to have frozen during the night. Not really surprising, as it had rained and snowed and sleeted during the night. I pushed and pulled and the wheel started to rotate a bit but there was still some resistance. So I put more weight on the bike and pushed and pulled and the front wheel started rotating again. Nice! Well, the wheel started rotating again, but, unfortunately something had gone wrong: the wire from the hub dynamo to the lights was cut when the wheel and the dynamo connector rotated but the wire stayed put. One nut had become so loose that when I tried to get the wheel spinning, the hub spinned with it. Not Nice. And this happened a few days after the other light on the bike stopped working. Two lights, neither working. Double Not Nice. So, although Movember just ended, I recommend you to check your Nuts!